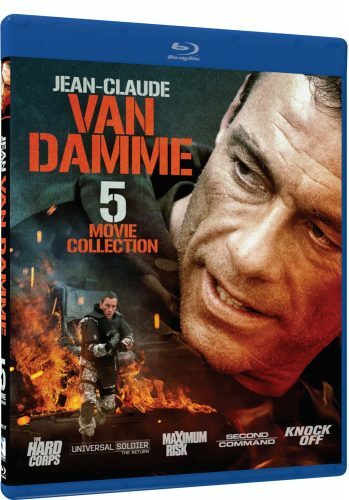 Jean Claude Van Damme is back On Blu-Ray with this 5 Movie set. Released by Mill Creek Entertainment and full of action packed violence from Van Damme’s filmography releases between the dates of 1996 – 2006. Jean-Claude Van Damme 5 Movie Pack as you can tell contains 5 of his films on Blu-Ray. The Set contains 2 Blu-Ray Discs with 3 films on one and 2 films on the other. Films included are The Hard Corps, Double Team, Maximum Risk, Universal Soldier: The Return, Second in Command. Not to be confused with the 5 Movie set released last year by Universal Which contains movies from his 1990 to 1996 catalog as this new set features films from his 1996 to 2006 catalog. Differences are with the new set we don’t get Digital copies and we don’t get A Movie per disc. Overall the 5 films in this set is a nice add-on to my collections. For me I enjoyed 3 of the films with The Hard Corps being my 1st choice with a Weird choose by most but in 2nd its Double team and Maximum Risk behind. Universal Soldier: The Return was the worst film of the bunch as it was not that great of a view and that leaves Second in Command just being an OK view. The Worst 2 films have not so great PQ but all the films have good Sound. Even though we get 3 films on one Disc two of the films still looked pretty good and sharp. A former Desert Storm special forces soldier is assigned the task of protecting a retired World Heavyweight champion turned powerful entrepreneur when the thuggish rap mogul he put behind bars comes gunning for revenge in this bullet-riddled action entry starring Jean-Claude Van Damme and Vivica A. Fox. When Wayne Barclay testified against music industry heavy Terrell Singletery (Viv Leacock), he made an enemy for life. Now Terrell is being released from prison, and his time behind bars has only fueled his hunger for revenge. Vengeance won’t come easy for this embittered ex-con though, because when Philip Sauvage (Van Damme) sets up a special team of vicious fighters and former soldiers to protect Barclay, the determined thug is will be forced to defeat a seasoned team of warriors with enough combat experience to wage a small war. The Picture quality is pretty good. Its sharp, the colors pop but some times the sky can blow out the picture in some scenes. The Hard Corps puts Van Damn in a role where he is suffering from PTSD from his past war fighting. He gets a job as a bodyguard to help protect a famous boxer who is in the cross hairs of a kingpin. The film adds Vivica A Fox who lay a decent part in the film. This is my first viewing of the film and I have to say I did enjoy it as Van Damme is playing a less energetic type role at first and the first portion of the film he is only in a few clips. The film does have a good amount of action more so on the gun action side. The plot I thought was decent along with the acting. The film also brings in some drama which is nice touch. With that said I give this movie a 3.5 out of 5 and I say give this film a shot. Counter-terrorist Jack Quinn misses his target, Stavros, on the eve of his final mission. From there, he is sent to “The Colony”, a rebirth for presumed-dead assassins. He breaks free from there, and seeks the aid of Yaz, a weapons dealer, for his final battle with Stavros. The Picture Quality is pretty good and just like Maximum Risk which is on the same disk its sharp and the colors pop. Close ups are really good-looking but colors could pop a tad more. Double Team is an action packed film filled with a few folks you might know like Van Damme, Dennis Rodman and Mickey Rourke playing the bad guy. Tsui Hark takes the Director role in which you can tell in some of the action has a few scenes that were Jet Li Esq. The Movie I thought was fun even though it gets low reviews I would give it a higher ratting as it’s a childhood fav of mine. Its filled with great action, gun battles, explosions, training, and Hand to hand action with Van Damme’s Kicking skills. Yes the movie is kind of goofy at portions and the plot is small but its a popcorn flick for me and Lets not forget acting wise it’s not the best. Overall I had a fun time watching and yes it’s not the best Van Damme film but I do like it more than most reviewers. Why? Again the action was fun and Mickey Rourke did a good job. I wish he was in the movie a little bit more. With that said I give this movie a 3.5 out of and some may say I’m crazy for it but I did enjoy the film as it was high-octane action but was filled with a few plot lines scene in other movies with a few goofy portions and perhaps in a happy mood today. Check it out. Luc Deveraux (Jean-Claude Van Damme), the heroic former Universal Soldier, is about to be thrown into action once again. With the Cold War over and defense budgets slashed, the entire Universal Soldier team is facing elimination, including SETH, the super-computer that controls the ultra-warriors. Knowing that his days are numbered, SETH decides to seek revenge by destroying his creators and implementing a reign of terror on the outside world. Morphing into human form as the quintessential Universal Soldier (Michael Jai White), SETH begins to unleash his wicked plan with the aid of his top soldier (Bill Goldberg). When conventional military strength fails to thwart his efforts, Luc must take charge. As Luc faces SETH and his team of unstoppable soldiers, a battle pitting man against machine and good against evil ensues, offering the kind of high-intensity sci-fi action you’ve come to expect from Van Damme in a story you won’t soon forget. Sound Quality sounds good. Crisp dialogue but could use a bass boost in the effect department. The Picture Quality is pretty good. From screen grabs of the stand alone release from Sony it looks the same and having 3 movies on one disc didn’t hurt it. Its pretty sharp on close-ups and colors pop. Maximum Risk is another film where Van Damme plays a look like whether it’s a twin, brother or in this case he just looks like this feared gangster who dies at the start of the movie. Van Damme’s other character is of course is a cop who goes and try’s to find out what went down with his look-alike. Yes it’s not Van Damme’s greatest film and or a classic like Blood sport but it still roles with the action on a more of a gun fire, crash and chase action style. Downside of things I feel the film runs a tad long and is in need of some hand to hand action throughout as its not showcased here as that is what he is most known for….His Kicks. Action portions are fun to watch bring the gun play mixed with martial arts and it’s another action star taking on the Mob. Overall its a fun film but could be a hit or miss for the average viewer. Van Damme fans usually like this film and I’m one of them granted yes not a classic but still has that action entertainment of a popcorn flick. Add more Martial Arts and cut the film down some during the slower portions and we would have gotten a better film. With that said I give this movie a 3 out of 5 thanks to the entertainment of the action and the plot isn’t that bad. Van Damme fans pick it up. The Sound Quality is pretty good just like the other two films on this disc but feel its a tad less better. Picture Quality is what takes a hit and just like its stand alone release it suffers from a darker picture. The PQ need to be brightened, close-ups are sharp-looking and colors do pop some but again its a darker picture. Universal Soldier: The Return is the sequel to Universal Soldier featuring more tech but suffers from a failing story. The film does contain flash backs from the first film and action wise is good but could be better. Acting wise could be better and the film runs slow at times and that not good for a film that only an hour and twenty minutes. The film has its ups and downs but more so it has more downs. Out of this disc this film is the least favorite. We could use more action a faster story and I feel the tech showcased in the film can get in the way sometimes. another down side is the movie doesn’t really follow the first film as you Van Damme is not a Super soldier in the second film. Overall it’s not a bad movie and still a decent watch if your following the Universal Soldier films. It does lack in a few spots which hurts its viewing enjoyment. With that said I give this movie a 2 out of 5 as its slow at times and could use more action. He’s a former Navy S.E.A.L. with the combat experience to protect U.S. interests anywhere. But the day he arrives at his new post in a turbulent Eastern European nation, Commander Sam Keenan is thrust into a bloody and chaotic scene. The Sound Quality sounds just like all the other films in the set which is pretty good. The Picture Quality is just OK. It’s the same quality as Universal Soldier: The Return. Its sharp in close-ups but not super sharp. Colors seem bland, flat and the film seems pretty dark just like the stand alone release. I have to say the PQ is the worst of the bunch. Second in Command is an Action filled film with a small story and at times can get slow. Not the worst film in this set as it’s a tad better but it does suffer from the same PQ. The story is self was just OK and the action was good with some hand to hand and lots of gun play. Acting wise it felt bland. Again just like Universal Soldier: The Return, this film has its fair share of downs but does a few more ups due to the action. From this box set of 5 its in 4th place. With that said I give this movie a 2.5 out of 5. It’s not worst in this bunch but it has its flaws. This film will be a Miss and or a mediocre view for its Viewers I feel.